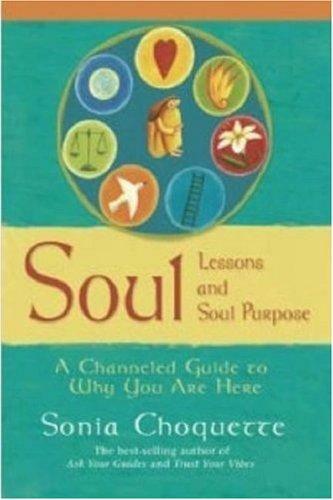 Soul Lessons and Soul Purpose is a book channeled by Sonia Choquettes spirit teacher guides, The Three Bishops, as well as Joachim and the Emissaries of the Third Ray. These highly evolved and loving guides work specifically to bring about understanding, direction, and support to all souls so that we may learn to become the creative masters of the life that were intended to have on Earth. The guides state that Earth is soul school, and that were here to master 22 basic soul lessons in order to fulfill our purpose. Each lesson is laid out in such a way that anyoneon any levelwill be ready to follow the instructions. Choquettes spirit teacher guides, The Three Bishops, Joachim, and the Emissaries of the Third Ray, state that Earth is a soul school, and were here to master 22 basic soul lessons in order to fulfill our purpose. Each lesson is laid out in such a way that anyone - on any level - can follow the instructions. The guides make it clear that now is the time to learn these lessons, open our hearts, and raise our vibration, or negative occurrences will worsen on the Earth plane. Now in paper. 256 pp.